I’ve noticed this over the past years. Kiran Chetry probably has more stories about working at Fox News than she was willing to share. I’m not going to deny that I do “check out” female anchors. I don’t give the words the say any more or less weight. I’ve had a crush on Ashley Banfield that awkwardly began when I watched her coverage during the 9/11 attacks. Cleavage, bare arms and short skirts; Kiran Chetry and Judy Woodruff on how and why female news anchors’ outfits have changed in recent years. It’s not hard to tell after watching which film was directed by a TV commercial director with no experience making a movie and Brian De Palma There’s no question which has a better plot, themes or visuals. It’s bad that Red Planet is full of decent actors who were completely wasted in what could be confused for big budget The Asylum mockbuster. Mission to Mars is a long drama that is about the first mission to Mars finding a greater truth about we are and where we come from. it’s about sacrifice and faith. The crew is tight-knit and a family. Two are husband and wife and it makes for a story where you care about the characters and what motivates them. Gary Sinise instead of losing his legs loses his wife and is no longer part of the mission crew. Lily Gray and Andy Dufresne’s relationship is great which makes the death between them matter and carry weight. Red Planet is a jumbled mess of ego maniacs with a shoehorned in female captain who’s somehow former Navy and not Air Force. Not ten minutes in we get a shower scene because reasons. The preceding conversation with Trinity and Rey Curtis begins with her wiping steam off a mirror in a bathroom and him putting clothes on. It could be from a work out but then where did the steam come from? She then on day 144 of their mission didn’t lock the door just so we could get a scene of Val Kilmer’s character Gallagher, yes Gallagher, walk in on her as she steps out. Their romance if one can all it that is so disjointed that it’s told in flashbacks instead of during the normal progression of the story to explain why she cares about the systems engineer AKA glorified janitor (there words not mine) Mission had great sets a few interesting space walk moments and motivations not just to care about what happens to the characters but what the mystery was behind the “face” that was found. There wasn’t a villain to defeat but mysteries to solve. What happened to the origins ground crew, what was the sound coming from the face? How did a black man get to not only get sent but survive when so many died? Red Planet’s plot is the Earth is polluted and overcrowded so we are looking for a new home and look to Mars. Bio Engineered algae is sent for 20 years to produce oxygen. O2 levels begin to drop and a team gets sent to find out why. There are throwaway lines about how we are going to trash the new planet (true) and some bs about having faith and philosophy. This comes from Zod who is chief science officer and “soul of the crew” (again their words) This had no pay off as the resolution to the decreases in oxygen levels. He and or his beliefs would have been better suited in Mission to Mars. Now for the major conflict(s). 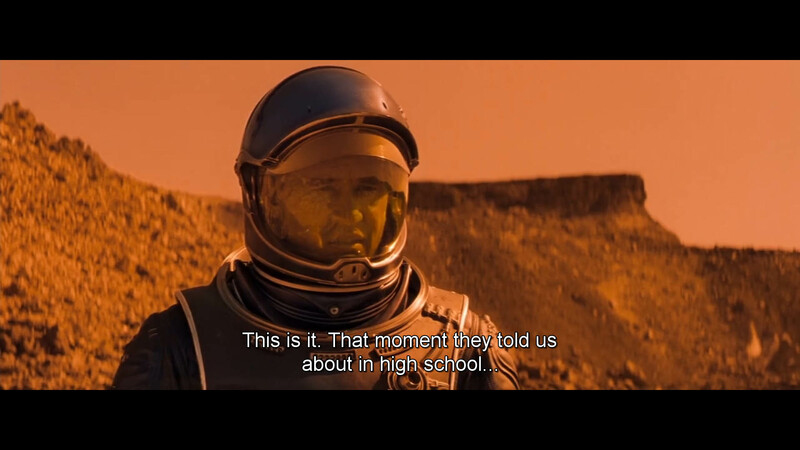 In Mission to Mars, the first crew members are attacked by a mysterious event and a rescue/recovery mission is sent. They run into their own issues and after finding the lone survivor, the set to solve the mystery before the leave. 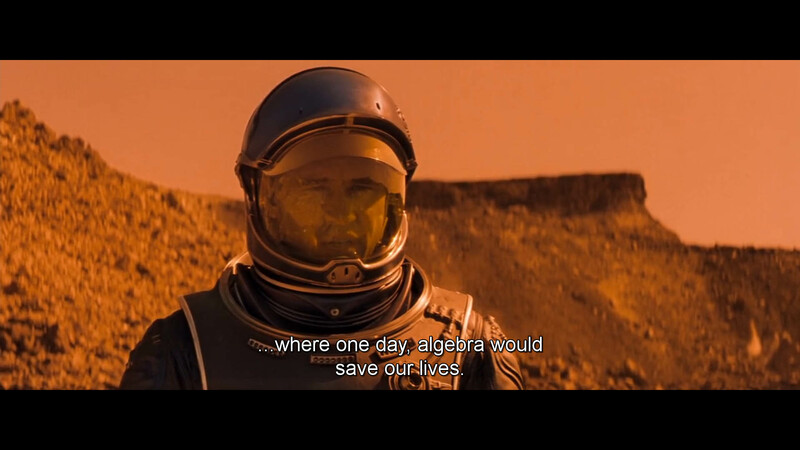 In Red Planet they have a small window to figure out what happened to the algae, and get back to the ship before Trinity has to leave them due to low fuel. Oh and their mapping exploration robot on loan from the Marines gets damaged during their crash and reverts to survival military mode when the crew mentions they want to pull her parts for a battery and radio. In Mission to Mars the finale is finding out the answer of why Earth had an explosion of life all of sudden and where we come from. In Red Planet the finale is val Kilmer having to outsmart a killer robot for it’s battery. I need to point out that I find it insulting that the character played bu Carrie Anne Moss (Trinity) is named Bowman and spends a bit of the movie alone talking to her ship’s AI computer much like David Bowman in 2001: A Space Odyssey. De Palma’s film seems to try to strike a balance between normal sci-fi and reaching for something more. I would have prefered to have more exposition about the nature of man and our yearning to explore. It covered well enough but didn’t blow me away. It’s the stronger of the two films by light-years. Mission to Mars takes us to another galaxy while Red Planet blows up on the launch pad. The Decision 2 : Coming back to you. I’ve never been a fan of LeBron. I respect his skills and he’s one of the best player currently in the game. He seems to be a good guy. I was and still am turned off by him due to the over saturation of the coverage he gets especially on ESPN (so thankful for Fox Sports 1). I wasn’t up in arms when he made “The Decision”. Didn’t watch didn’t care. I was a terrible way to make the announcement and I did begin to root against him a little. It didn’t help that many of his new teammates in Miami I didn’t care for. They did become a team to “hate”. I get moving to further your career and chase the ring. I’m more of a team fan loyalist. Some of my favorite players; Stockton, Isiah Thomas, Reggie Miller and David Robinson all played for one team. The Heat won games. They did under some suspect flops and favorable calls by the refs. I never liked to join in on the piling on of the personal attacks and insults about hairlines or if the Heat had a dinosaur playing for them.I will admit some of those memes were funny as hell. That being said I’m happy that he’s going back to Cleveland. It’s not just his hometown but the city needs it. They have been a running joke for years. Don’t have much luck with sports but they at least aren’t Detroit They picked up Johnny Football and while he hasn’t played a single game he’s a draw for the city and will put bodies in the stadium and will help the transition to the NBA season. They might make it insufferable to watch ESPN but only time will tell. As of this writing I don’t know if the #1 over all pick Andrew Wiggins will remain with the Cavs but he may be used in a trade to get Kevin Love. Love is one of the best Power Forwards who’s already expressed an interest in playing with Lebron. Beyond the on court possibilities, LeBron’s wife is pregnant with their third child. I truly do believe that he wanted to take his family back home and win at home. In other words the “King”….. This is the kind of thing that comes across my social stream and at first glance I want nothing at all to do with it. My stupid curiosity gets the best of me and after reading this and reviews on game is more intriguing. These social freemium games are the new hot thing. I admittedly play Simpsons tapped out and a Famliy Guy game. It’s the I’m bored waiting on something app(s) I will never spend actual money but I get the attraction of the games….if you care about the subject of the game. The game does seem very vapid but then again to be a fan of the Kardashian’s one has to be ok with that lifestyle. I like many hear about the kardashian’s and have the knee jerk reaction of “I can’t believe people care about this” Then I remember that if it wasn’t her it would be someone else and she isn’t a criminal isn’t spreading crazy political or anti vaccine theories. Over the past 20 years, big names from Beyoncé to former Secretary of State Hillary Clinton have drawn massive crowds to the “party with a purpose,” which has become the largest African American music festival in the U.S. Essence is owned by TIME parent company Time Inc.
Well this doesn’t make me want to go to any California restaurants anytime soon. I don’t like to eat out often because of of the not knowing who prepared my food. Now that I know that people will not be required to wear gloves, I’m even more turned off. I can understand the backlash from a bartender, however that shouldn’t cause a complete repeal of the law. I’m really looking forward to this Nickelodeon is doing a great job with the current cartoon and it’s one of the best versions. Period. This film is obviously modernized and “gritty” That’s ok. There’s offical cannon that allows for various versions and I like that this is going for a more realistic approach. I do hope this does well and we get Krang and Casey Jones in a sequel. Following the debut of all four character posters, Paramount Pictures has released a new trailer for Michael Bay’s ‘Teenage Mutant Ninja Turtles.’ The trailer features new footage includes a better look at all four turtles, Splinter, April O’Neil, and more. What’s interesting is that William Fichtner is credited as playing ‘The Shredder,’ but he might not be the one wearing the suit.